The early 1990s marked a watershed period in the history of the Arab-Israeli conflict. The Gulf Crisis redefined the balance of power in the Middle East, reshuffled inter-Arab relations and demonstrated once again the need to work toward a just and comprehensive regional peace. Moreover, several other factors converged during this time to produce a situation propitious for pursuing peace. The termination of the Cold War allowed the Arab-Israeli conflict to be treated as a regional problem. This, combined with the international realization that Arab-Israeli peace is necessary for regional stability, provided the spark to re-ignite a hitherto dormant peace process. Sensing a window of opportunity following the liberation of Kuwait, the United States and the Russian Federation co-sponsored the Madrid Peace Conference in October, 1991. During the Madrid negotiations, Jordan extended an umbrella to the Palestinian delegation, allowing them to negotiate with the Israelis directly for the first time. Almost two years later, on September 13, 1993, the PLO and Israel signed their Declaration of Principles (Oslo I), outlining a negotiating framework to be followed leading to a final status treaty between the Palestinian and Israeli peoples. This opened the road for Jordan to proceed on its own negotiating track with Israel, and the Jordan-Israel Common Agenda of negotiations was initialled one day after the PLO-Israel Declaration of Principles. On July 25, 1994, King Hussein met with Israeli Prime Minister Rabin in the Rose Garden of the White House, where they signed the Washington Declaration, formally ending the 46-year state of war between Jordan and Israel. Seeking to lay a firm foundation for a just, comprehensive and lasting peace, the treaty also outlined a number of areas in which negotiations would continue. To this end, Jordanian and Israeli negotiators have signed a series of protocols establishing a mutually beneficial framework of relations in fields such as trade, transportation, tourism, communications, energy, culture, science, navigation, the environment, health and agriculture, as well as cooperatory agreements for the Jordan Valley and the Aqaba-Eilat region. 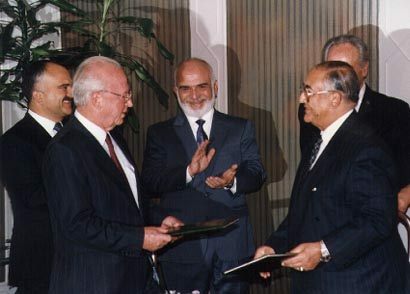 King Hussein, Crown Prince El Hassan, Israeli Prime Minister Rabin, Jordanian Prime Minister Majali and Israeli Foreign Minister Peres exchange copies of the initialed drafts of the Jordan-Israel Peace Treaty, October 17,1994.